Exactly 100 years ago today on 1 July 1916, Staff Captain Eugene Bourdon, GSA’s first professor of Architectural Design was killed in France at the Battle of the Somme. As a mark of respect, an information board has been placed in the foyer of the School’s Reid Building to commemorate Bourdon’s ultimate sacrifice. Later this year (from November 5th), an exhibition ‘Eugene Bourdon: From the Classroom to the Battlefield’ will open in the Reid Building showcasing some of Bourdon’s architectural drawings and related material held in the GSA Archive. The following blog post is part of a series by Fiona Hall examining Bourdon’s life and career. Fiona is contributing to the on-going research looking into the contribution that GSA staff and students made during the Great War, both on active service and on the home front. Today marks the Centenary of the Battle of the Somme. Fought in Northern France, it was one of the most devastating battles of World War One. For 141 days the British and French armies engaged the Germans in what is often described as a ‘battle of attrition’. It was on the 1st July – the first and bloodiest day of the battle – that Eugene Bourdon, the School’s first Professor of Architecture was killed. Following his death, letters sent to the school from staff and colleagues illustrate the admiration, sorrow and grief felt towards the death of Bourdon. In a letter to Director Fra Newbery, one colleague and friend wrote: ‘Our dear friend Eugene Bourdon has been killed on the 1st of July… no more beautiful death could end a straighter life’. This post is the first of three instalments to mark the centenary of Bourdon’s death. Through the letters and material in our collections we hope to shed light on a man, and soldier, who was never far from the thoughts of colleagues and students, despite his distance from the School. Born in Paris on 16th July 1870, Bourdon studied at the Ecole des Beaux-Arts as a pupil of the respected Atelier Honore Daumet. It was during this time that Bourdon gained the knowledge and experience that would help shape his later career. Featured below are some of Bourdon’s beautifully detailed student drawings, housed in our collections. Click here to view more of Bourdon’s work. After graduating in 1896, Bourdon worked as an inspector for the French Government at the Paris Exposition Universelle of 1900. The Exposition was a world fair held to celebrate the achievements of the last century. Following this he moved to New York, where he worked on one of the city’s earliest skyscraper buildings. Upon his return to Paris, Bourdon was interviewed by the newly appointed Professor of Design at GSA, Adolphe Giraldon; he was asked whether he would consider writing a report on the condition of architectural training in Glasgow. Bourdon agreed to carry out the task and, following a visit to Glasgow in 1904, a report was submitted. 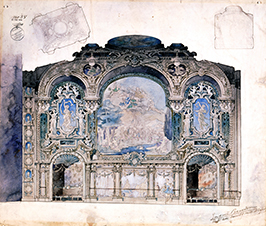 Part of the report recommended the appointment of a Beaux-Arts trained professor to lead the newly created Department of Architectural Design. The School impressed by Bourdon and his credentials approached him and asked if he would be interested in taking up the post himself. Pictured below is a letter from Bourdon to a member of staff in which Bourdon states how ‘contented’ he was with his appointment at the School. First half of letter from Bourdon to GSA staff member. Glasgow School of Art Archive and Collections (archive reference GSAA/SEC/1). 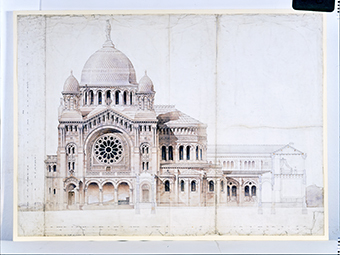 In the decade following his appointment, Bourdon nurtured the Department of Architecture. Placing emphasis on the traditions and ideals of classicism, his teaching and direction energised the school. Bourdon, along with several colleagues worked between the Art School and the Technical College to provide students with a well-structured syllabus with the full aim of broadening their minds and expanding their horizons. However, following the outbreak of the war in 1914, Bourdon decided to return to fight for his home nation. Writing in The Flower and the Green Leaf, Robert Proctor notes that Bourdon’s desire to ‘fulfil his duty to his nation’ was as strong as his ‘sense of duty to an artistic belief’. ‘The Flower and the Green Leaf: The Glasgow School of Art in the time of Charles Rennie Mackintosh’ edited by Ray McKenzie.